Established in 1998 and based in Hamilton, New Zealand, Enlighten Designs is one of New Zealand’s largest website design companies delivering innovative and customer focused technology solutions. Their clients range from medium enterprises to large corporate and government organizations. While Enlighten Designs relies on its own infrastructure based in Auckland to serve its client base, leveraging the cloud for overflow capacity has been very rewarding. While using AWS as part of the live streaming solution, they have deployed instances on Amazon Elastic Cloud Compute (Amazon EC2) to power the underlying infrastructure for streaming live footage of the events. The team at Enlighten Designs shares the architecture (see Architecture Diagram below) designed to stream the cricket series between New Zealand and Pakistan. 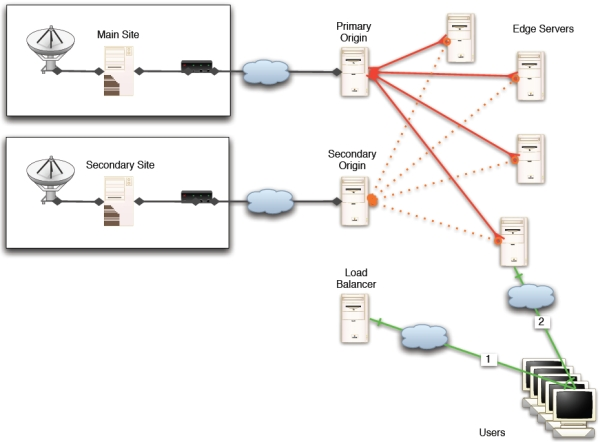 For the Winter Olympics event, the architecture differs slightly; essentially, all the streaming of content begins at an origin server, and then spreads across 5 additional edge servers to connect to a load-balancer to allow even bandwidth distribution, ensuring a reliable service for viewers. By using Real Time Messaging Protocol (RTMP), the streaming audio and video is delivered to the servers via a Flash player over a secure HTTPS connection through Wowza Media Server 2. Each edge server then allows for around 250 streams. To accurately monitor and maintain the correct load, a Firefox plug-in known as Elasticfox is also being used by the team. The ElasticFox tool allows for an easy-to-view dashboard with one-click functionality to scale up or down additional resources as streaming levels change. To learn more about how AWS can help your media streaming needs, visit our Media Sharing details page: https://aws.amazon.com/media-sharing/.